Having a paving service retouch your catch basin and drainage system up to par is the first line of defense in preventing water buildup and damage to your parking lot. Drainage systems are the underappreciated heroes of safe parking lots. So how does a catch basin deteriorate? Its very job is to accumulate excess water and keep it out of the way. As water sits in the basin it can eat away at mortar and metal pieces, causing crumbling, popped out pieces, and cracks. This just happens naturally through the passing of rainfall and cold seasons. Professional pavement services can actually fix up the casing pretty quickly. Often if the problem is caught early all you need is a simple patching of asphalt. What happens if you don’t catch it early? The surface of the basin will sink and let standing water accumulate, a potential liability when it freezes in cold weather. If the mortar starts to pop out, it can be another liability as a tripping hazard. Sunken and popped-up bits are dangerous for vehicles to drive over. Cracks can spread to surrounding pavement. The casing may completely cave in. You’re suddenly paying for major in-depth repairs. Not very appealing. A lack of good drainage in your lot can cause all sorts of other issues like hydroplaning vehicles, flooded buildings, and simple water stains that need a good power washing. How are you going to provide upkeep for your parking lot’s catch basin and overall drainage system, then? Regular inspections by your paving service will be your best bet. Catching any potential issues early on makes repairs faster, easier, and cheaper. Not to mention the fact that catching it early also lowers your chance of being liable for injuries and accidents. Keep an eye on how your drainage system is holding up in rough weather, too. If there’s a big snow storm, check for damage to your drains and basins from snow plows. If heavy rains have set in and your drainage system doesn’t quite seem to be keeping up, then you know it’s time to call in the professionals. Sometimes build choices for your catch basin just weren’t wise. For example, most experienced pavers will use concrete instead of asphalt for the catch basin’s collar. Concrete, being a combination of 60-65% aggregates like crushed stone, gravel, and sand, 15-20% water, and 10-20% cement, lasts particularly well against water and petroleum contact. 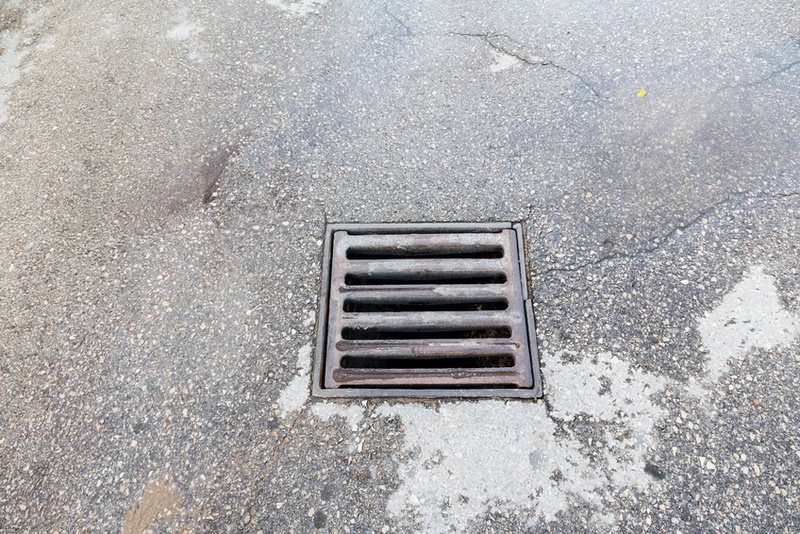 Because of this, a concrete collar lasts four times as long as asphalt without sinking around the drain’s metal grate. With that in mind, always choose experienced paving services with a good track record of quality work to minimize future upkeep.